Academy Dance Center presents The Polar Express! 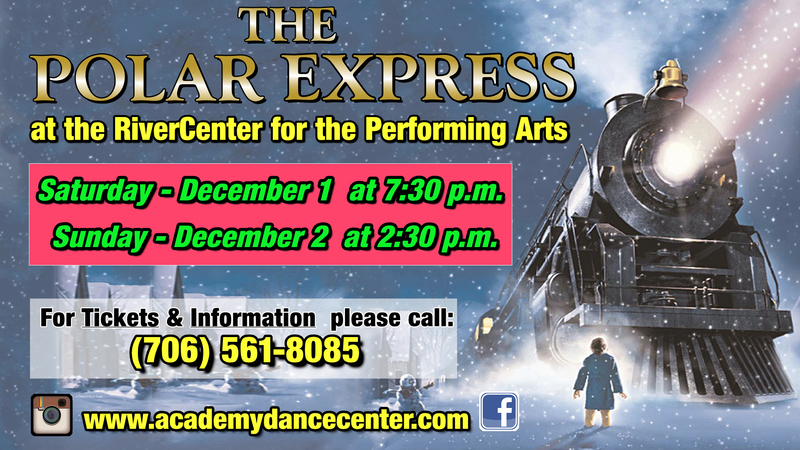 The Academy Dance Center will present ‘THE POLAR EXPRESS!,’ specially adapted for the dancers of the Academy’s 2018 Ensemble Company, at the RiverCenter for the Performing Arts on Saturday, December 1st at 7:30 p.m. & Sunday, December 2nd at 2:30 p.m. When a doubting young girl takes a magical train ride on Christmas Eve to the North Pole, she embarks on a journey of self-discovery that shows her that the wonder of life never fades for those who believe in the spirit of Christmas. This heartwarming holiday adaptation is excellent entertainment for the whole family and features a large ensemble cast of local children and adults. For Information & Tickets, contact the Academy office at (706) 561-8085.